We examine the usability and performance of Tablet PC direct pen input with a conventional Graphical User Interface (GUI). We use a qualitative observational study design with 16 participants divided into 4 groups: one mouse group for a baseline control, and three Tablet PC groups recruited according to their level of experience. The study uses a scripted scenario of realistic tasks and popular office applications designed to exercise standard GUI components and cover typical interactions such as parameter selection, object manipulation, text selection, and ink annotation. We capture a rich set of logging data including 3D motion capture, video taken from the participants' point-of-view, screen capture video, and pen events such as movement and taps. To synchronize, segment, and annotate these logs, we used our own custom analysis software. We find that pen participants make more errors, perform inefficient movements, and express frustration during many tasks. 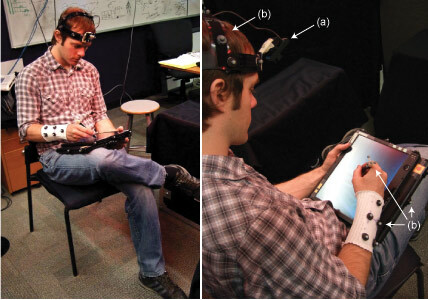 Our observations reveal overarching problems with direct pen input: poor precision when tapping and dragging; errors caused by hand occlusion; instability and fatigue due to ergonomics and reach; cognitive differences between pen and mouse usage; and frustration due to limited input capabilities. We believe these to be the primary causes of non-text errors which contribute to user frustration when using a pen with a conventional GUI. Finally, we discuss how researchers could address these issues without sacrificing the consistency of current GUIs and applications by making improvements at three levels: hardware, base interaction, and widget behaviour.